Tap EV at the bottom of the screen, and use the displayed slider to correct the exposure. If you check a still image and feel that it is too bright or too dark, adjust the brightness and retake the photo to obtain the desired brightness. Move it to the right to brighten the photo or to the left to darken the photo. In still image shooting mode, you can set ISO sensitivity, shutter speed, white balance, interval shooting conditions, image size, live view and you can turn post view on/off to suit the purpose of your shooting. 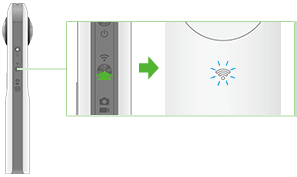 If the Wi-Fi connection fails, check the Wi-Fi settings of the smartphone. If a still image is taken while connected to a smartphone with a GPS function enabled, position information is recorded for the photo. 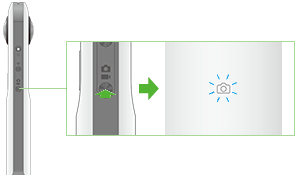 If [Transfer method] is set to [Move], still images are deleted from the internal memory of the camera after being transferred to the smartphone. Photos can also be taken using the shutter button of the camera. However, these still images are not transferred to the smartphone. The exposure compensation settings return to the default when the power is turned off. If the shutter speed is set slower than 1/8 second in manual mode, all lamps turn off. If images are shot with noise reduction set in auto mode, all lamps may turn off.